Oooo, a Mac user! I've been thinking about distributing native Mac builds, but I don't have a Mac on my end for testing. As such, a Mac build would be experimental, since I'd have never run it myself. Do you have a Windows PC available, man? Mazarus wrote: Don't much else about it, but I'm already thinking about seeing if I can upgrade anything on it with the funds I have. I'd say that if you can upgrade anything, I'd advise adding more RAM. 4GB is just barely over the minimum system requirements, but it'll only run small worlds. I might have to impose a global population cap for 4GB systems, too - I need more testing to see if it'll be necessary, but if you can get up to 8, you'll be in the clear of the harder constraints. Sadly, I can't get much more about my desktop due to Windows 10 being unhelpful in my searching. Administrator wrote: I'd say that if you can upgrade anything, I'd advise adding more RAM. 4GB is just barely over the minimum system requirements, but it'll only run small worlds. I might have to impose a global population cap for 4GB systems, too - I need more testing to see if it'll be necessary, but if you can get up to 8, you'll be in the clear of the harder constraints. I was actually just talking to my brother about upgrading my storage just a couple of hours ago. Pretty sure he could help me order some to work with. If you have any other suggestions on what to do with my laptop, i'd love to hear them. Mazarus wrote: I was actually just talking to my brother about upgrading my storage just a couple of hours ago. Pretty sure he could help me order some to work with. If you have any other suggestions on what to do with my laptop, i'd love to hear them. Gladly! Outer Colony has a bit of a different technical architecture, when compared to most other games. I can get into more technical details (feel free to ask why it needs these things, if you're curious), but Outer Colony feasts on RAM. 4GB is a bit low to run an OS and the game, which is to say that Outer Colony will have to run in a low-memory mode. This winds up limiting how big worlds can be potentially some things going on in the worlds. Your CPU is also very important. I get into some details in the page describing Outer Colony's engine, but even the sort of CPU you want is a bit different. Most games can't really take advantage of multicore CPUs, so for many gaming applications, higher computational capacity in a single of your CPU's cores is the most important thing. This isn't so for Outer Colony. It'll use all your cores to (virtually) the same extent, so the more parallel processors you can throw at it, the better. Most of the game's development was done on an 8 core Bulldozer, which proved ample. If you're working on a budget, I'd say your top priority should be getting to 8GB of RAM (16+ being ideal). A CPU upgrade would go a long way, too, and I can get into more specifics there, if you'd like. But you certainly don't have to upgrade your computer to play OC in a basic capacity! You should be above the minimum system requirements right now. Awwwwwwwwwwww, yeah!!! This should be a solid build for Outer Colony. Those 24GB of RAM make me smile - I always like seeing those above-and-beyond sorts of numbers. When did you get or build this PC, man? build this PC long time ago... 1t configuration was 8gb ram, gtx 660 and old hard drives. Half a year ago i upgrade to this config. CubeTwo wrote: build this PC long time ago... 1t configuration was 8gb ram, gtx 660 and old hard drives. Half a year ago i upgrade to this config. That's the way to do it. You can get so many years of life out of a PC these days, with the application of judicious upgrades. The machine I use to develop Outer Colony was initially built 5 years ago, and I've been replacing core components as necessary. 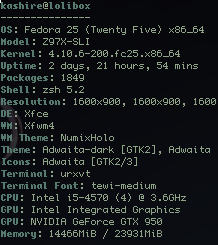 Oh man, here's a screenshot of my specs. Freakin' solid, man! This should beast through Outer Colony. And you're rockin' Fedora! I've actually never run a Linux test, but Outer Colony *should* work mostly fine there. If I produced a Linux build, would you want to be the first to try it out? Oh man, for sure. That would be pretty sweet.